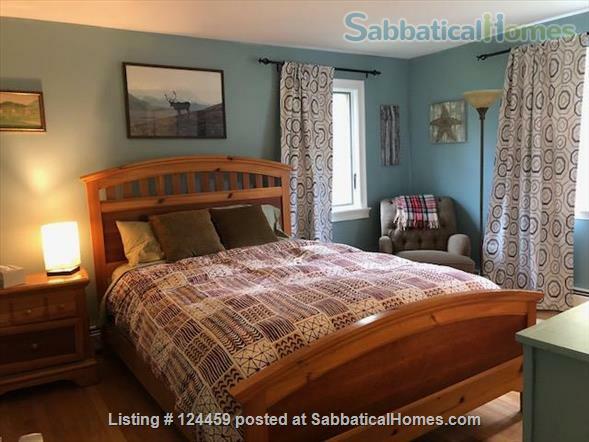 This home is a perfect destination for a sabbatical or a combined sabbati-vacation, located in one of the most beautiful parts of the U.S., the southern coast of Maine. There are many attractive sites to visit nearby, including Acadia National Park, the cities of Brunswick, Freeport, Boothbay Harbor, and Portland Maine, and excellent coastal and mountain hiking trails. Swimming and boating are possible only a few meters away from the cottage, fantastic bird and sea-life opportunities, and nearby hiking and biking trails. The cottage was designed to be spatially and aesthetically comfortable as well as environmentally friendly, and includes a green roof, passive solar heating, and local constructional materials. Despite the tranquil setting, it's located only a few minutes away from nearby towns, shopping, and major highways. The cottage is approximately 1,000 square feet (300 square meters), and includes 2 bedrooms (each with a queen bed), a loft (with two single mattresses), a full bath, well-appointed gourmet kitchen, and an open living area with an integrated dining room and work space. Perfect for academic or creative projects, a relaxing vacation, or just a change of scenery and new experiences along the beautiful coast of Maine!